Burial traditions can vary based on regional customs, community practice, and religious beliefs. This is nowhere more apparent than in the Plain communities of here in Lancaster County, PA. The Amish families that have called Central Pennsylvania home for over 200 years have developed unique traditions in remembering and honoring their loved ones. The Amish are a conservative Christian religious order from the Anabaptist tradition in Switzerland. In the 1700s, the first Amish settlers came to North America, settling in what is now Pennsylvania, Ohio, and Indiana. According to a 2017 study, there are over 74,000 Amish living in 497 distinct communities in PA – the largest concentration of Amish in the world. One of the distinct features of Amish communities is their regulations on technology, transportation, and attire. 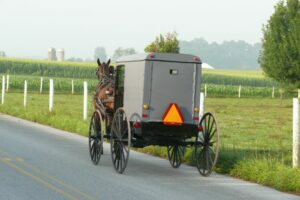 Here in Pennsylvania, the main methods of transportation for the Amish are bikes, scooters, and horse & buggy. Due to these cultural practices, the Amish are commonly referred to as members of the Plain communities. The unique customs and traditions of the Amish can be seen in how they celebrate and honor the deceased in their community. The entire process – from preparing the body to the funeral and burial – usually takes 3 days and involves the entire Amish community. Embalming the body is permitted and is done by a local funeral home, being careful not to apply makeup or making cosmetic corrections. After embalming, the family takes over, dressing the loved one in all white and placing them in a simple handmade wood casket. Like the deceased they honor, an Amish funeral is a simple, plain event. The viewing and funeral happens in a family home or barn, depending on the size of the gathering. There are no flowers or decorations at an Amish funeral, and no eulogy is given. Instead, the funeral service is much like a typical Amish church service, with sermons, prayers, and hymns – all conducted in Pennsylvania Dutch. Since the Amish do not have church buildings, they have dedicated fields for use by the community as a cemetery. A simple graveside ceremony is held before the casket is lowered into the hand dug grave. Amish gravestones are simple and without decoration. Instead, a map of the cemetery is used to keep track of the plots; this cemetery plot map is often included in the local church directory. 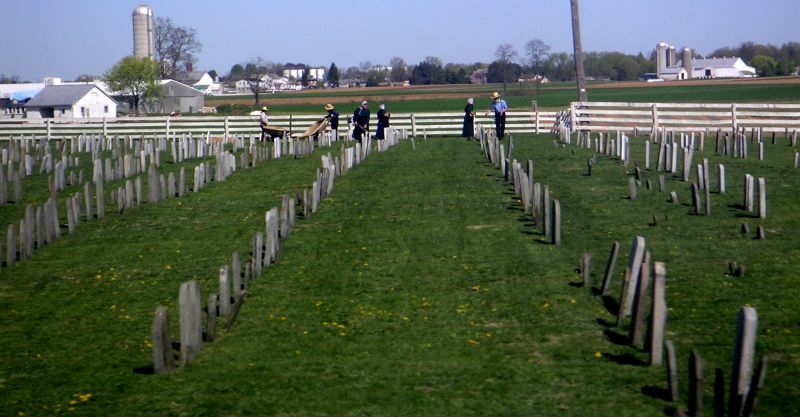 Like other faith and family communities throughout the nation, the memorial traditions of the Amish in Lancaster County are a true reflection of the beliefs and traditions of the community. And local funeral directors, monument companies, and members of the greater community are willing to support them in remembering their loved ones.